Syrians—4.8 million of them–constitute the largest segment of the current world refugee population. But there are many other refugees —16+ million — who are not getting equal media attention. We read a lot about people fleeing the war in Syria, who are taking dangerous boat trips across the Mediterranean to Europe and hoping to settle in safer parts of the world. 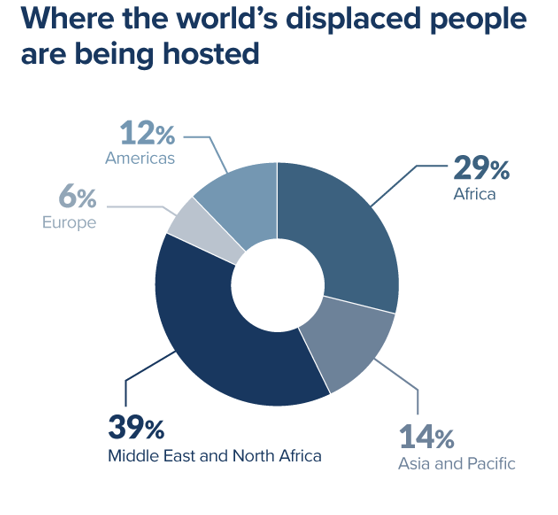 But, worldwide, many other men, women and children are displaced outside of their countries. They’re just as desperate and just as in need. If you’re interested in the numbers, here’s a rundown of those other refugees, with data supplied by the United Nations High Command on Refugees [UNHCR]. Before looking at statistics, it’s important to get the definitions right. According UNHCR, politicians, news media and people in casual conversations often don’t make the proper distinction among refugees and migrants, and that can be a problem. …One of the most fundamental principles laid down in international law is that refugees should not be expelled or returned to situations where their life and freedom would be under threat. …conflating refugees and migrants can have serious consequences for the lives and safety of refugees. Blurring the two terms takes attention away from the specific legal protections refugees require. It can undermine public support for refugees and the institution of asylum at a time when more refugees need such protection than ever before. Who’s fleeing, where are they, and how many are there? After Syrians, the next largest group of refugees arriving in Europe are Afghanis fleeing Taliban rule. UNHCR reports that there are 1.5 million registered Afghan refugees in Pakistan, with hundreds of thousands more unregistered living in the shadows. 350,000 Somali refugees currently live in the Dadaab refugee camp in Kenya, making it the largest refugee facility in the world. Some residents of Dadaab have been there for as long as nine years. About 2,000 refugees from Afghanistan, Iraq and Syria are confined by Australia on an essentially uninhabited island off its coast. Between 200,000 and 500,000 members of Myanmar/Burma’s persecuted Rohingya minority are living in refugee camps in Bangladesh. Early this year, the Bangladesh government began moving forward with a plan to move the refugees to a remote island that is underwater for much of the year. 5.2 million Palestinians are registered as refugees by the UNRWA. Which countries are hosting the refugees? UNHCR also maintains large refugee camps in India, Tanzania, Uganda, South Sudan, Mauritania, Jordan, Gaza and Ethiopia. Personally, as a person of first-world privilege, I admit that I find these numbers unfathomable. To make the statistics relatable, I have to resort to a rather small-minded, ethnocentric comparison with cities I’ve been to: Lebanon, for example, is hosting as many people as currently live in San Antonio, TX. If everyone living in Cleveland OH left the city, that number would equal Chad’s refugee population. The conditions that have forced these people to run for their lives, and for the lives of their families, are as scary as they come. Can any of us sitting comfortably in front of our computers reading this imagine ourselves on the run, or living in the conditions the refugees are enduring? I can’t. I know, too, that writing about this situation isn’t much. But at the very least, we owe it to these other human beings to know that they exist and to reach beyond ourselves to try to help.